With Victorian accents on the outside and contemporary features on the inside, this three bedroom house plan has marvelous custom detailing throughout. The covered wrap-around porch connects to the deck in back. Columns dramatize the foyer leading to an unusual octagonal great room with a deep tray ceiling. Nine foot ceilings extend height throughout the plan. A generous kitchen takes center stage with a custom-style counter and easy access to the dining room, breakfast bay, and deck. 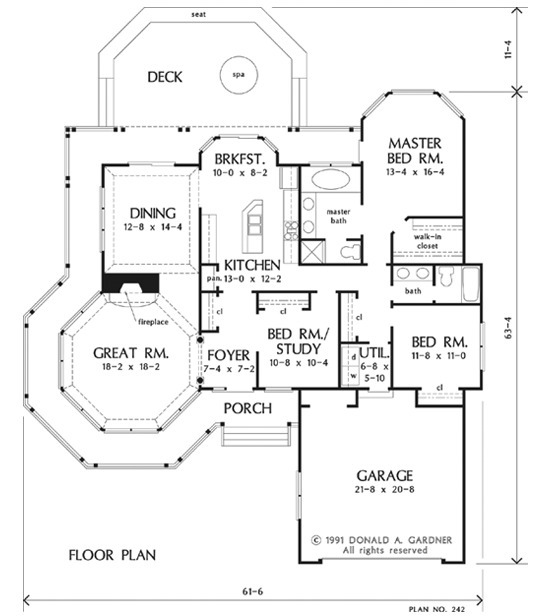 In this floor plan, the master suite opens to the porch/deck and pampers with a garden tub, shower, double vanity, and walk-in closet. House Dimensions: 61' 6" x 63' 4"
Great Room: 18' 2" x 18' 2"
Foyer : 7' 4" x 7' 2" x 9' 0"
Dining Room (Tray): 12' 8" x 14' 4" x 9' 0"
Great Room (Tray): 18' 2" x 18' 2" x 11' 6"
Breakfast Room : 10' 0" x 8' 2" x 9' 0"
Utility Room : 6' 8" x 5' 10" x 9' 0"
Garage Storage : 7' 4" x 2' 0" x 0' 0"
Master Bedroom : 13' 4" x 16' 4" x 9' 0"
Bedroom / Study : 10' 8" x 10' 4" x 9' 0"
Bedroom #2 : 11' 8" x 11' 0" x 9' 0"
Porch - Front : 36' 10" x 5' 0" x 0' 0"
Porch - Rear : 39' 8" x 5' 0" x 0' 0"
Porch - Left : 5' 0" x 35' 10" x 0' 0"
Deck / Patio : 27' 10" x 17' 4" x 0' 0"